Walgreens plans to open in historic downtown building. Deerfield, Illinois-based Walgreens is planning to reenter the downtown Atlanta market with a new store at the historic Olympia Building. 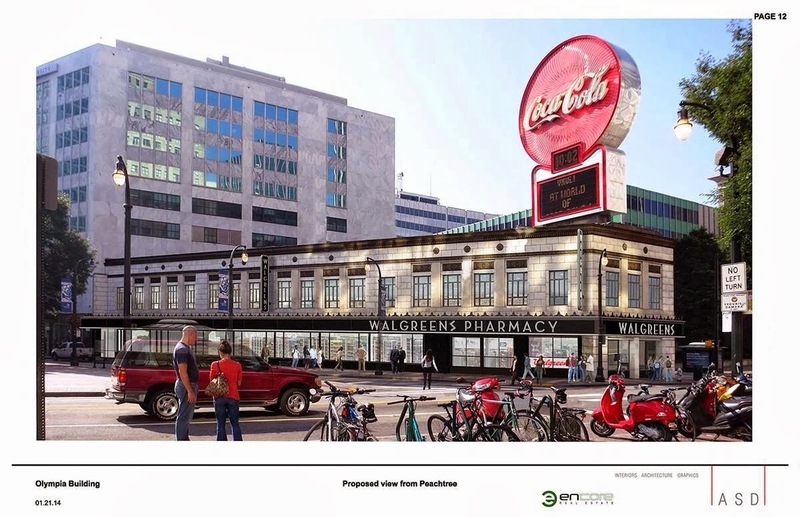 The Olympia Building may best be known for its roof tenant, the giant neon Coca-Cola sign. Sitting at the dynamic corner of Edgewood Avenue, Peachtree Street and Decatur Street, the Olympia Building was built between 1935 and 1936. 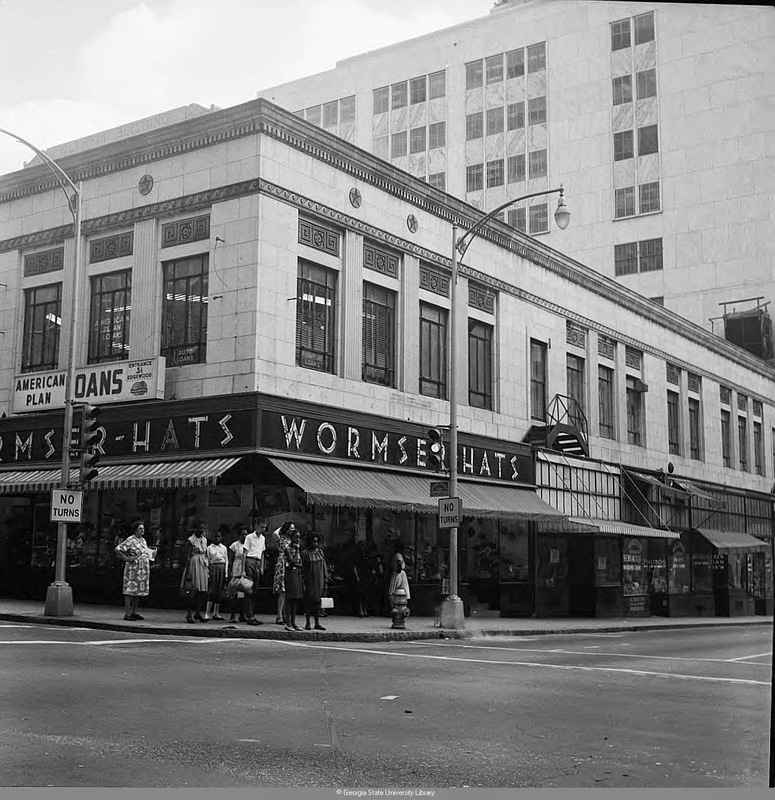 Wormser Hats was one of the oldest known tenants of the building's ground floor although research earlier this week indicates that Woolworth's, one of the most successful and well known five-and-dime stores, also once called the Olympia Building home. The building was also reportedly put to use during the 1996 Centennial Olympic Games, but I was unable to verify for what exactly the building was used. Most recently, the building was home to independent retailer 5 Points Sports, as well as an office of the Atlanta Ambassador Force of Downtown Atlanta. Walgreens seems destined to continue the trend of successful "W" businesses. Amazingly, Walgreens plans to recreate the vintage look and lettering of the era. According to the plans, WALGREENS PHARMACY will be etched in art deco lettering on multiple sides of the building, on a "new black aluminum canopy marquee to match historical precedent." the tip portion of the pie shaped structure, made open air in the 90s, will be once again enclosed and become selling space for the pharmacy. 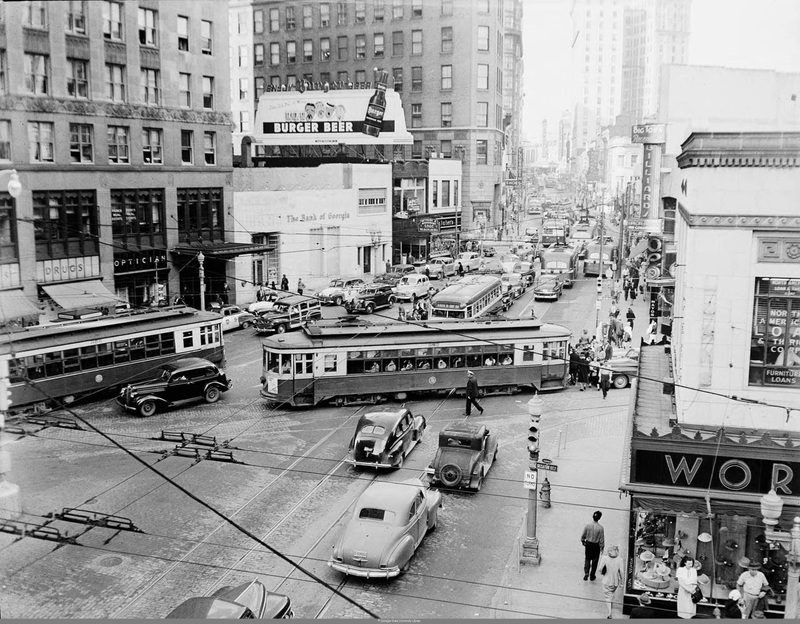 Looking north up Peachtree, we see the tip of the Olympia Building, lower right, as well as the old Atlanta Street Car and a billboard for something called "Burger Beer." The building has had a number of owners over the years including real estate magnate Ben Massell, the Ackerman family and most recently the City of Atlanta. Last fall, a company called CSH-23 Peachtree LLC purchased the Olympia Building for $2.2 million. Woonsocket, Rhode Island-based CVS Pharmacy operates two locations in downtown Atlanta. One, at 12 Broad Street, is located adjacent to Five Points MARTA station. The second and newer location opened in early 2012 at 235 Peachtree Street at Peachtree Center in the most recent downtown Brooks Brothers space. Real estate sources say that the Walgreens deal for this space has been in the works for over five years, and that at one point Walgreens was insistent that that their logo replace the Coca-Cola signage atop the building. I recalled Walgreens previously having a location downtown and the trusty Atlanta Time Machine was able to provide the photographic proof I was looking for. 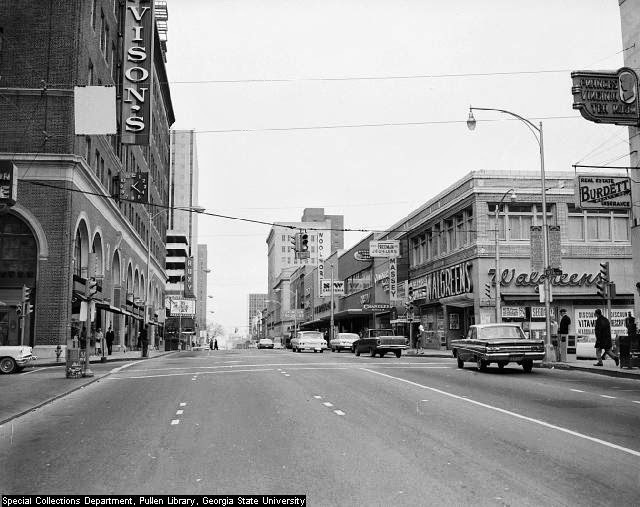 Walgreens was previously located at the corner of Ellis and Peachtree Streets. Today, the site is home to The Ritz-Carlton Atlanta which was built in 1983 and opened in 1984. The photo was apparently taken in 1965 but I'm unsure for how long Walgreens was in that location. Walgreens started in Chicago in 1901 and today has nearly 8700 locations that produce over $70 billion in revenue annually. Walgreens is no stranger to historic buildings, having already opened in a number of landmark locations around the country. Dubbed the "fanciest Walgreens," the drugstore opened a huge multi-level location near Chicago's Wicker Park / Bucktown neighborhoods in 2012. The 30,000 square foot Walgreens is reportedly the nations largest drugstore and features upscale amenities such as a juice and smoothie bar, in-house eyebrow beautician, an expansive wine and beer selection, as as well a sushi bar. The drugstore is housed in the old Noel State Bank building, a stunning 1920 masterpiece and registered Chicago Landmark. Another Walgreens opened in a significant portion of the former Boston Five Cents Savings Bank in Downtown Crossing Boston. The drugstore occupies about 25,000 square feet of the 40,000+ square foot building and offers similar amenities to the giant Chicago location. 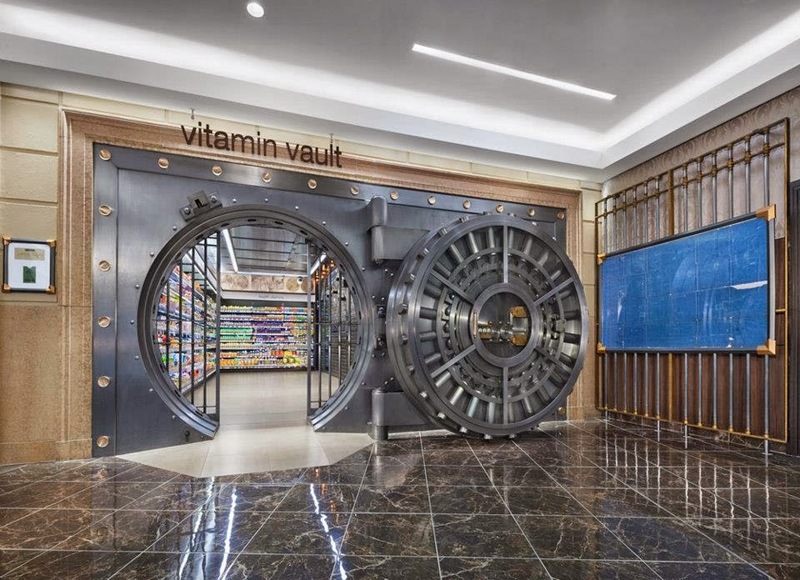 The coolest aspect of the Chicago store is the "Vitamin Vault,", featured in the 1987 movie "The Untouchables," the vault was preserved and restored for its current use. Both the Boston and Chicago locations are classified as "flagship" locations. There are also others in San Francisco, New York and Los Angeles. A typical Walgreens is 13,000-15,000 square feet, whereas flagship stores are usually 20,000-23,000 square feet. Although I've been told that the ground floor of the Olympia Building measures 10,000 square feet and the upper floor should be about the same size, I doubt we will get a full-on "flagship" store. Instead, I suspect Walgreens will open perhaps a hybrid concept store, a scaled down flagship, if you will. 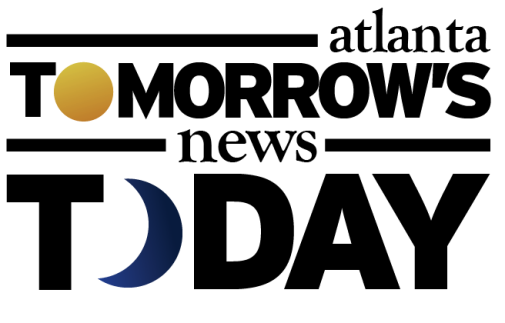 As a graduate of Georgia State, I know all too well the dearth of options for groceries and other related items, but I also know that the crime, panhandlers and "urban campers" can be a deterrent for new business development. I don't think there are enough "higher income" shoppers in the area to support the higher end offerings of a "flagship" store. Whatever concept Walgreens ends up opening, it will definitely be a welcome sign downtown. Long past due for a place like this to open up on the south end of downtown. Too many vacant storefronts around, too many ghetto barbershops. It seems like whenever there's a vacant spot downtown, a ghetto barbershop will fill it. Those types of businesses add nothing to the appeal of downtown and detract from it. We need more businesses like Walgreens opening up to try and gentrify and clean up the south end of downtown. How is a barbershop ghetto? Isn't this an example of how the market works....vacant retail space, barbershop moves in, business is good, barbershop stays. Business is so good several barbershops move in, competition is created, some close, and some stay. So a business moves in, employs people, pays rent, pays the city taxes, and provides a service that is obviously needed (or they wouldn't have any business). I would think the appeal would be in having an active retail establishment move into a vacant retail space. As one who works downtown, actually catty-corner to the proposed Walgreen's, I don't think downtown's downfall is barbershops. Why don't we focus on the shlock clothing stores, incense shops, and Underground itself. I can't tell you the last time I was in Underground - other than wayward tourists, I'm not sure who does go there. I've worked downtown for 15+ years and except for some daytime activity brought in by GSU that has given us decent (although not wonderful) Broad Street eats, it remains sad, sad state of affairs. If the only place willing to open downtown is a barbershop, then you've got real problems. Seems like the past few years, about 5 or 6 of these have opened up all around Woodruff Park. And they are 'black' barbershops. It's a real issue when these places only appeal to one segment of the population. Much of downtown, especially the south end, is starving for real retail activity that draws life and people to downtown, not these junk places. If it's near the GSU campus, then it might be able to succeed. Shocked that the area is even in consideration. There's so much crime everywhere that it does not justify the location. "There's so much crime everywhere that it does not justify the location." I find it hard to understand why anyone would invest in this Olympia Building. As others have pointed out, this area is devoid of foot traffic apart from some GSU students and a lot of homeless people who hang out nearby at Woodruff Park. It's bound to be a a bust of a project. 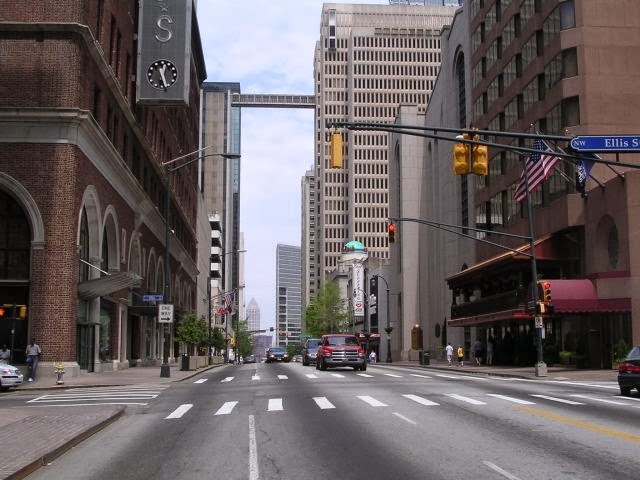 Downtown is dead as a retail market. It will continue to limp along with offices, wayward tourists and GSU for many years I'm sure but that's about it.  Who will prove to know more, real estate professionals or anonymous internet commenters? I guess we'll find out. I work in a building at Five Points and me and my co-workers are looking forward to another pharmacy in the area. As to the comment about no foot traffic in the area, please visit the area at lunchtime on a nice day to see what really occurs there. As someone who used to work downtown, I'm amused at all the "downtown is dangerous, nobody goes there" comments. That part of town (Underground and Woodruff Park) are only going to get better, and people that actually go there already know that. barbershops are obviously fronts for criminal activity. I'm always amused of how a dead building can be crime prone? I mean really? This has got to be the most illogical peace of thinking I've ever heard of. Don't get me wrong crime happens everywhere but let's be honest here: if you were a rogue and seeking to rob something/someone where would you go?to the supposed near empty mall or to a mall like Lenox Square? A robber would most likely go the Lenox because it's a financially prosperous mall with upper crust shops in it. Why would a robber pass up that mall for Underground. Honestly, I don't feel anymore safer in uptown..or even Midtown ATL. Its crazy how people have a panic attack going through downtown ATL yet tons of crime have taken place in both places. For one, people make excuses for them .According to some, crime isn't suppose to take place in Midtown or Uptown ATL because it looks nice and have nice things in them....OMG!!! Danger is danger no matter where you are. You can't escape it and don't ever think that just because you live in a nice neighborhood that crime won't strike.It is those neighborhoods that are more at risk for crime than the of called ghettos.That is just common sense. Great to see Walgreens reuse a historic building rather than tear another down. My father worked at Wormser Hats in this building from the 30s to the mid 40s. He decorated the windows and was noted for hi creativity. There were news articles about his Baptist World Alliance and Gone With the Wind windows in 1939. I have photos of a window that showed the history of the location. This is where George Washington Collier had his first store, and when he became Postmaster, it was the location of Atlanta's first post office. I never remember a Woolworth's ever being there.